The Headset Place will tell you all you ever wanted to know about headsets. Searching for information on headsets? After failing to find a comprehensive, independent and informative source for telephone headsets that are available in Australia, I decided to create The Headset Place. I believe that we all need to really understand a product before we can choose correctly. Don't you agree? Are YOU Confused? Join the crowd. Choosing a headset can be confusing as there are headsets for mobile telephones, computers/gaming headsets, wireless headsets, on-ear headsets, in-ear headsets, single ear headsets, dual ear headsets, Bluetooth headsets, headset amplifiers, short boom headsets, long boom headsets and acoustic shock protection devices. 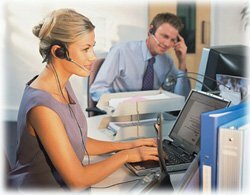 The purpose of The Headset Place is to make you knowledgeable on all headset issues - but in particular telephone headsets. That way you can make the correct "value" judgement. If I haven’t covered the information you require, please feel free to send your requirements to me via my contact form. Does the headset fit my telephone? Can they connect to my mobile? Should they be wireless or wired? Should it be on ear or in ear? Should it fit on both ears or one ear? Are they affected by static? Over what distance do wireless headsets work? Can they be used in a noisy environment? Do they offer any protection from sudden loud noises (ie acoustic shock)? Bluetooth headsets, what are they? How do headsets help relieve neck and shoulder pain? How can I convince my boss to buy me a headset? What other factors do I need to consider regarding headsets? Your headset questions are important, so if The Headset Place doesn't currently provide the information that you need please let me know. I will research your queries and answer them. I promise to reply to you and of course include what I find out here. If you need information regarding headsets then other people will to, so please don’t hesitate to contact me.